I was beyond excited to read The Reluctant Assassin when it came out earlier in 2014 because I adore Eoin Colfer. The Artemis Fowl series is brilliant (and although I have many people violently disagree me on this: I think it far superior to Rowling’s Harry Potter series). I was both disappointed with and drawn into The Reluctant Assassin. It is, like Colfer’s other works, creatively and solidly plotted. It is a fast-paced (almost breakneck speed) and thrilling adventure. I found myself holding my breath, clenching my stomach and reading faster at certain moments as if I was being chased myself. Chevron Savano is a 17-year-old orphan turned quasi-FBI agent. She is a castaway from an ill-conceived and now defunct teenage-agent-in-the-schools, CIA-covertly-funded FBI initiative to root out young people being recruited by middle-eastern terrorist organizations. The program blows up in a spectacular way when Chevie discovers the Iranian family she has “infiltrated” is no more terrorists than she is; but they ARE victims of violent prejudice from their fellow American students. After defending the family in self-defense the program goes public and an embarrassed FBI ships Chevie to England to babysit an empty room with a single agent for a year or two until the publicity dies down. Furious, Chevie’s abrasive, sarcastic attitude both frustrates and inevitably endears her to Agent Felix Smart, under whose command she finds herself in London. Meanwhile, in Victorian London in 1898 14-year-old Riley is apprentice (though not by his own decision) to the murderous mercenary Albert Garrick. When Chevie discovers she is babysitting a time travel pod, a wormhole connecting Riley’s time to hers the two young people, along with the terrifying Garrick are thrown into an edge-of-your-seat, life-and-death race to return to and remain in their own time. Things are complicated when it is revealed that Riley has connections unbeknownst to him to both 1898 AND the present. My biggest issue with The Reluctant Assassin–and it is a HUGE one–is the level of violence in the story. I actually checked it out of the library immediately upon its arrival but was so appalled by the violence of the first 2-3 pages that I angrily returned it. I checked it out again because I DO love Colfer and felt I had perhaps not given The Reluctant Assassin a fair chance. It is completely inappropriate for a book touted (and shelved in the library) as a juvenile reading choice. The violence is on a par with many adult thrillers I have read by authors such of James Patterson and Dean Koontz. The violence portrayed in The Reluctant Assassin is absolutely accurate to the Victorian Age among the criminal element in London at the time, but the graphic nature of Colfer’s portrayal is unnecessary to convey the evil undertones and extraordinary suspense of the story. Even as a young adult selection I have reservations, given what we know about brain development in adolescents. However, truthfully, there are many other young adult novels which contain similar levels of violence. 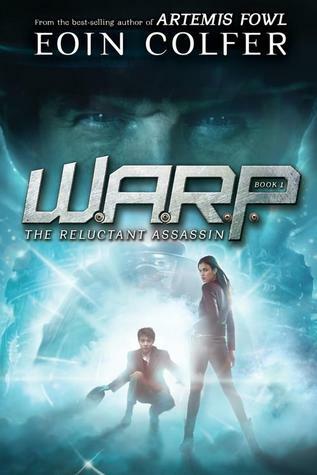 The Reluctant Assassin is the first in a new series (WARP) by Colfer. Honestly, I will read–and have already checked it out from the library–the second in the WARP series, as Colfer’s storytelling remains masterful. But I do NOT, under any circumstances, recommend it as a children’s reading selection.